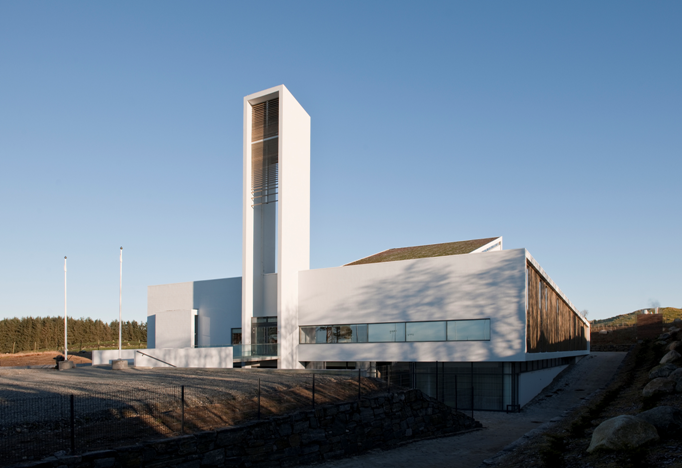 The Frøyland and Orstad church is one of the most recent churches in Norway, consecrated in December 2008. It is designed by architects of the architectural firm Link Signatur. The church is interesting for many reasons, such as the way it came into being, the enthusiasm and involvement of the local community, and the fact that it is a parish church for two municipalities. The most interesting aspect, however, is the building itself and what it tells about the ideals of Lutheran worship in our time. 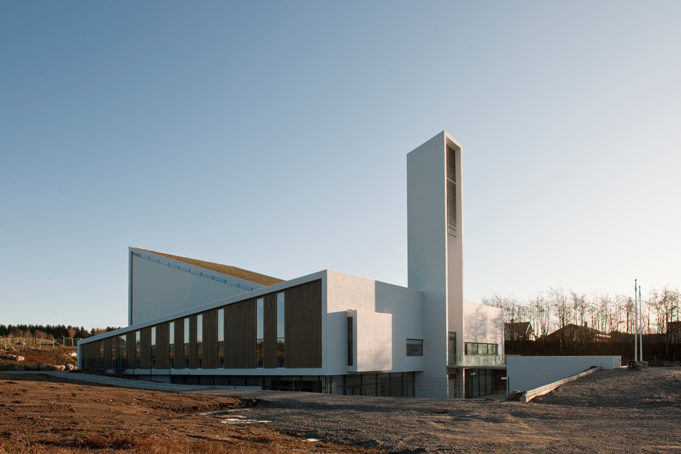 The Frøyland and Orstad church is, like many recent churches, a ‘multifunctional church’ for an active congregation with high expectations. It is far from a traditional country church surrounded by a churchyard. Here we find a large parking lot in front of the church. The building is large (over 600 seats) and has several floors with rooms for various purposes. The roof over the worship space rises upwards to the east, while the roof over the adjacent rooms rises the other way. The floor and large glass walls are sunk below ground level, surrounded by spaciously landscaped outdoor areas. Entering the church from the parking lot one crosses a bridge and passes through a space underneath the tower. Instead of the traditional church hall the church has a foyer with a reception desk, a café and LCD screens hanging down from the ceiling. It gives the impression of a busy conference centre. This looks more like a community centre than a church. 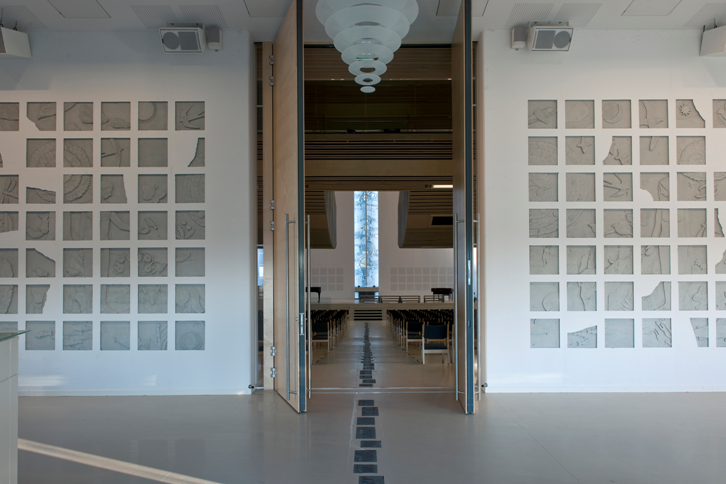 The high doors leading into the worship space and the adjacent walls, decorated by the artist Tor Lindrupsen, emphasize that this is indeed a house of God. The worship space is a vast hall with a floor sloping down to the stage in the chancel that dominates the front of the room. The front wall has an even surface with the exception of a high, decorated and lit-up niche containing a small altar and patches with perforated, sound absorbing holes. The artistic work in the niche has been done by Per Odd Aarrestad. The assembly hall has been built in such a way that a huge congregation can sit comfortably while following what goes on in the chancel. If it were not for the small altar and the baptismal pool in front of the stage the room could be perceived as a spacious lecture auditorium. 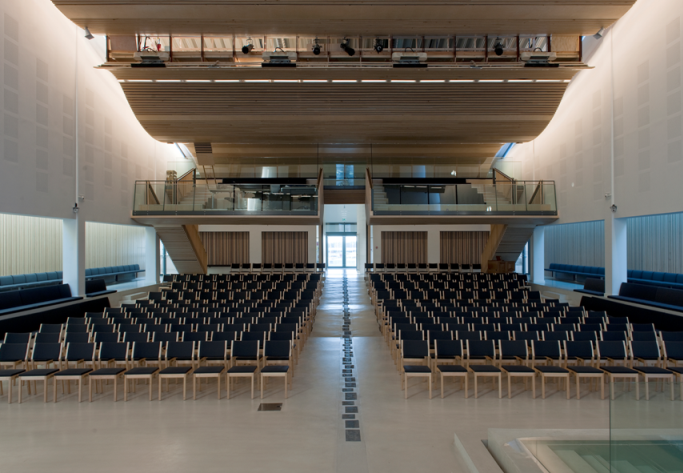 The worship space suggests a modern free church. If we look at the concept in an international context, the church has similarities with the mega churches found in the USA or Korea. It is equipped with sound, light and recording equipment. 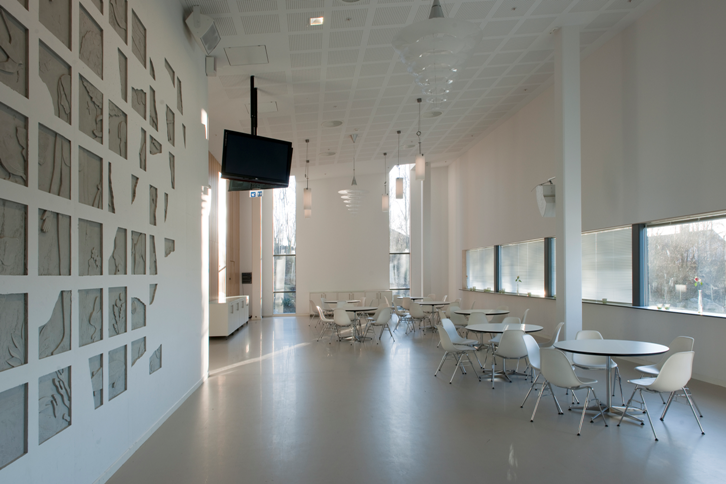 The technical rooms are hidden away on a gallery that is nestled into the undulating and acoustically designed ceiling. The church breaks with traditional worship spaces as we have seen them throughout history. It also breaks with the more recent liturgical ideal that assembles the congregation around the altar with the altar positioned ‘versus populum’ on a level floor. As more traditional symbolical elements function the baptismal pool, the small altar, the bright altar niche and the inscribed tiles positioned in the floor, marking the way from the entrance to the chancel. The most striking feature, however, is the large white space itself, which has similarities with the many museums and churches designed by architect Richard Meier. There is no ‘back bench’ or space for solitary contemplation: all is exposed as in an old theatre. 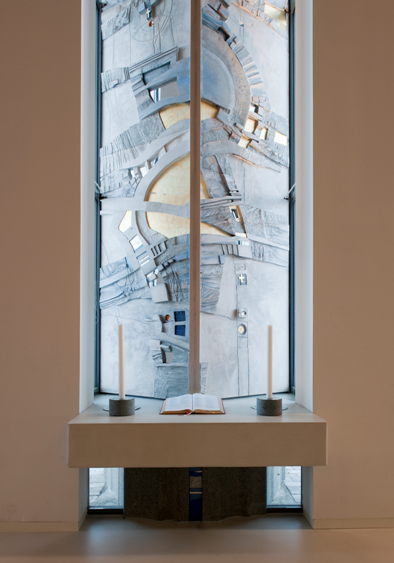 The elements in the chancel may easily be removed, so that the worship space can be used for different activities. Even though this church bears no resemblance to classical places of worship, the interior has been carefully thought out and the details are of high craftsmanship. Oddbjørn Sørmoen is Director for Department of Church Buildings and Heritage Administration in KA Association for Employers in the Church of Norway and Church-related NGOs. Education: Mag. art. in Art History from University of Oslo, Bachelor in Business Administration from the Norwegian Business School, supplementary education in Restoration Art from Royal Institute of Art, Stockholm. Work experience: Senior Adviser for Directorate for Cultural Heritage Oslo/Norway, Special Adviser for Places of Worship, English Heritage London/England. Editor of the 6 volume series of “Kirker i Norge”, “Churches in Norway”. In charge of the Nordic project “Accessibility to Cultural Heritage”, published 2009.